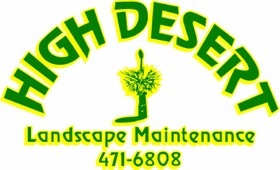 At High Desert Landscape Maintenance, Inc. we offer full landscape design and landscape installation services. Our design team has over 40 years of design experience ranging from small residential projects to large municipal plazas, parks and schools as well as large commercial projects. We can help design any property you may have with interest to the viability of the landscape over the future years. Our installation team uses only the best plant, hardscape and irrigation materials available to insure a lasting product. Our installation methods are up to industry standards and we carry a required MS-6 state license for irrigation work. 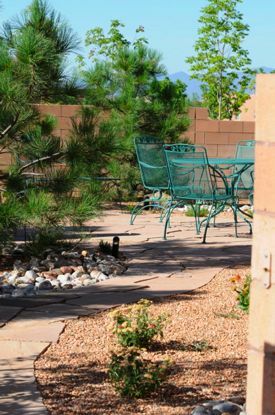 It is our desire to design and install a landscape that will add both value to the customer's property and create a lasting impression to those that enter it. Give us a call and let us schedule a meeting so we might help you with your landscape design and installation needs. We purchased a vacation home in Rancho Viejo, south of Santa Fe, about two years ago. The home was about a year old and had NO landscaping in the back and side yards and very little in the front. We are from the Midwest and knew that we wanted a natural look but needed a lot of assistance with the ideas of irrigation, plant choice, ground cover, etc.